It’s amazing what happens when one piece of a seemingly complex puzzle falls into place, and you realize it was never complex at all. Simply different, maybe a little foreign, and rare — for the time being. That’s how it was with chouquettes, but they’re merely a template — a very simple template — for all the wonderful things you can fill choux pastry with. I’m riding that French pastry train through the woods, past pristine rivers and pines, and into Paris. Next stop: Éclairs. All aboard! Choux-choux! I vaguely remember eating frozen eclairs with my mom when I was a kid. She can neither confirm nor deny this memory. But somewhere along the way I developed a taste for the cold, vanilla custard, bound within a delicate but substantial pastry (also cold, in my mind) and sporting a shawl of chocolate ganache. I don’t buy them nearly as often as I should for the amount of love I harbor for them, but now that I’ve discovered how easy they are, it’s all I want. Using last week’s choux pastry as a base, they’re simply piped into logs, baked at a high temperature, then baked longer, bringing down the heat in increments to dry out the hollowed shell. The pastry cream, or crème pâtissière, is simply a basic custard: milk and/or cream, egg yolks, sugar, flour, and a pinch of salt, thickened over the stove and then chilled and piped into each shell. Both these elements can be made in advance — and the latter, especially, should. Once filled, a simple ganache made with hot cream and chocolate is poured over the top. Done. 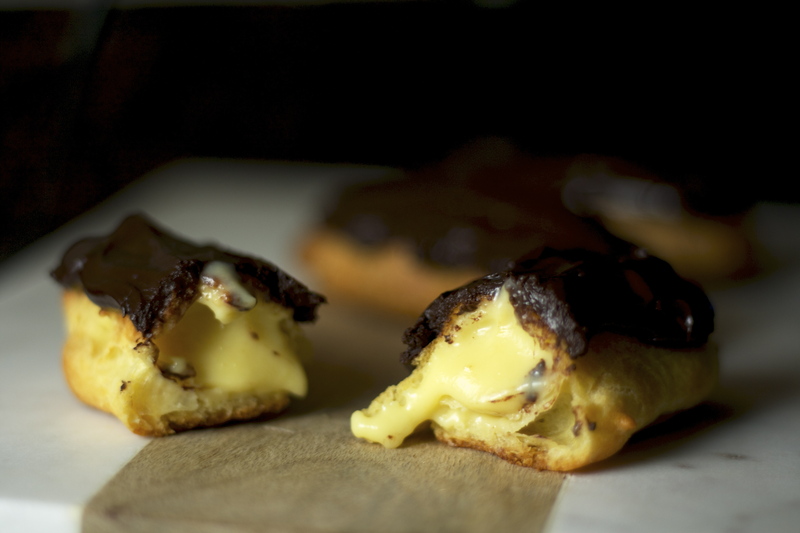 You have yourself an éclair — or 12. This recipe, too, is a template. You can bet you’ll be seeing some variations here in the future, but I’m not so sure there’s anything better than the classic. So simple, so perfectly balanced, so elegant. While something like cinnamon raisin bread makes me feel like a kid, éclairs — so disarmingly sophisticated — always make me feel like an adult. I think they always did, and that’s why I liked them. When I was young, I wanted to be older. Now that I’m older, I’m okay with the fact that I’m grown up enough to make something like this. All the other stuff — the bills, the worry — can wait. Ready to board? 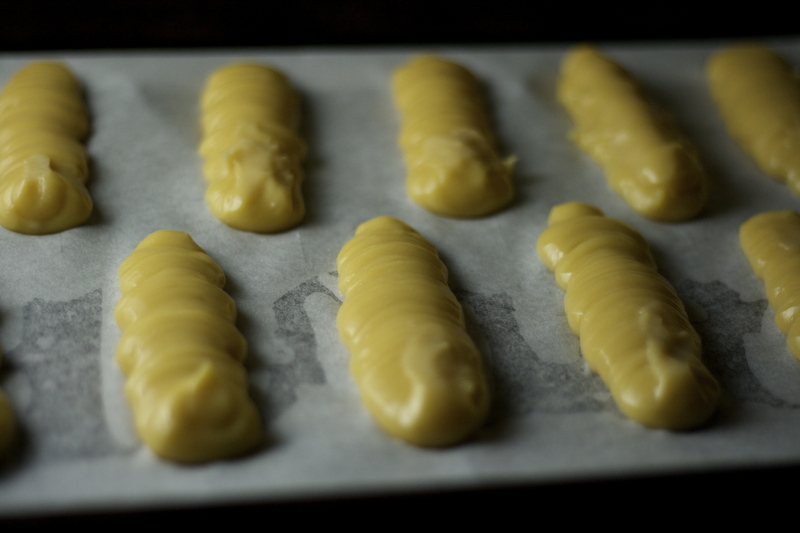 Preparing the pastry cream in advance takes the stress out of preparing eclairs. I used vanilla extract here because it’s so easy, and everyone has it, but if you feel inclined, add vanilla bean seeds directly to the milk mixture as it’s heating. For the ganache, I used bittersweet here but found the 72% cacao bars I have a bit too overpowering for the delicate pastry cream. Next time I will probably either use semi-sweet or a mixture. If you have a sweet tooth, use milk chocolate. The possibilities are endless! Pro tip: if you’ve forgotten to take the eggs for the choux pastry out of the fridge in advance, you can save time by bringing them to room temperature in a bowl of warm water. They should be ready to go by the time you’ve gathered all your ingredients — which you’ll certainly want to do before you begin. In a medium bowl, combine the sugar, flour, and salt. Add the egg yolks and stir until the mixture forms a thick paste. Set aside. Heat the milk or cream in a small saucepan until you begin to see whisps of steam rising, swirling the pan every once in a while. Do not let it come to a boil. Once hot, pour a bit of the hot milk or cream into the egg mixture and whisk to combine. Slowly continue pouring the milk, whisking continuously. After it has been thoroughly combined, pour the mixture back into the saucepan. 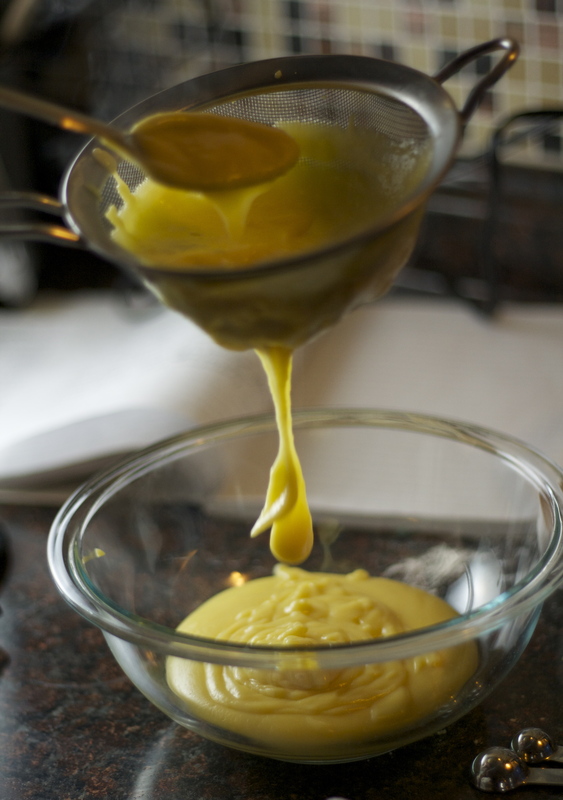 Heat the custard over medium heat, whisking constantly. It will thicken to a pudding-like consistency seemingly suddenly after a few minutes. When this has happened, pause whisking every few seconds to see if the mixture has come to a boil. If you see large bubbles pop on the surface, whisk for a few more seconds and remove the pan from heat. Stir in the vanilla extract. Pour pastry cream into a strainer set over a medium bowl. Stir to push it through, catching any bits of cooked egg. Cover the bowl with a piece of plastic wrap pressed right against the surface of the cream and chill completely in the refrigerator before using. Preheat oven to 425 degrees with an oven rack in the center. Line a baking sheet with parchment or a silicone baking mat. Heat the water, salt, sugar, and butter in a medium saucepan, stirring until the butter is melted. Remove from heat and immediately dump in the flour all at once. Immediately begin stirring vigorously until the mixture pulls away from the sides of the pot into a smooth ball. Allow to cool for 3-5 minutes. Beat in the eggs, one at a time, until the mixture is smooth and shiny. It should hold its shape when scooped but still slide back into the pot when released. You may only need three eggs, or you may end up using all four. Transfer the mixture to a large piping bag fit with a 1/2 -inch tip, or a large zippered bag with a corner cut. Pipe the mixture out into 4 ½-inch logs, about an inch wide. You should be able to fit 12 onto a regular sized baking sheet. Smooth and even out the tops and sides with a wet finger or the back of a spoon dipped in water. Place in the oven and bake for about 15 minutes, until puffed. DO NOT OPEN THE OVEN DOOR FOR ANY REASON. This will interfere with the pastry’s rise and you’ll be left with flat shells without room for pastry cream. With the oven door closed, lower the temperature to 375 degrees and bake for another 18-20 minutes. Lower the temperature again to 300 degrees and bake for a final 15 minutes. Remove from the oven and pierce one end with a toothpick or sharp knife to release the steam. Let cool completely before filling. Using the tip of a sharp knife, cut three small Xs into the top of each shell. 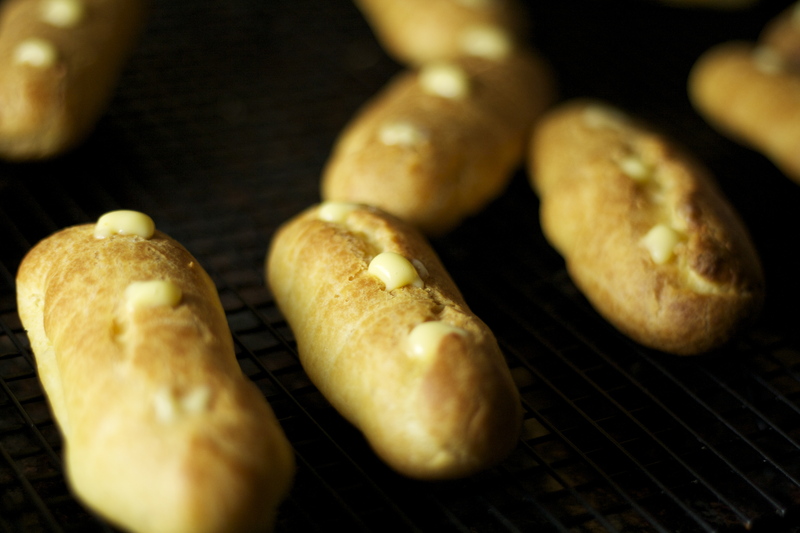 Fill a pastry bag fitted with a ¼ inch tip (or zippered bag with a corner cut) with the pastry cream and pipe into each X until each éclair is completely filled. Wipe off any pastry cream that’s popping out. Make the chocolate ganache by heating the cream in a small saucepan or in the microwave. Pour over the chocolate and stir until completely melted. 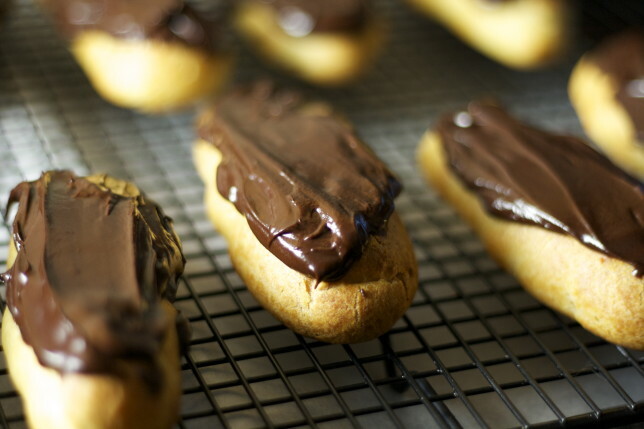 Pour or spread over each éclair, or dip each eclair directly into the chocolate, allowing the excess to drip off before placing right-side up. Allow chocolate to set for 10-15 minutes before enjoying. 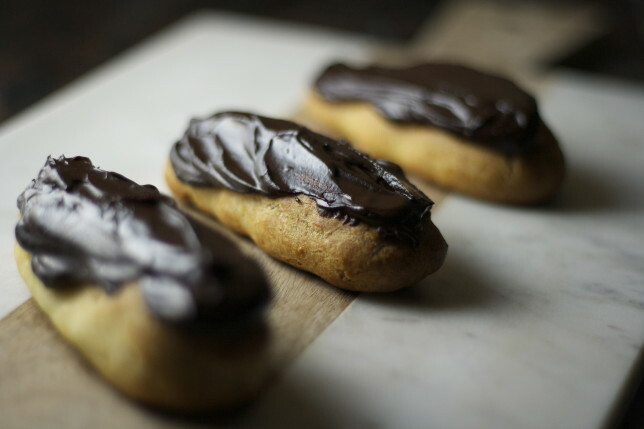 Éclairs are best eaten the day they’re made.